Canadian filmmaker Apolla Echino was tired of seeing men get to have all the fun in adventure films and is on a one-woman mission to change that around. The film charts a solo surf road trip of the South Island. In the freezing New Zealand winter, Apolla is often the only surfer in the water. Canadian filmmaker Apolla Echino was tired of seeing men get to have all the fun in adventure films and is on a one-woman mission to change that around. Her documentary series, A Woman's Guide To The World, has taken her aboard a tall ship sailing to Antarctica and into the wildest corners of the Amazon jungle. But it's the latest chapter, a wintertime surf trip across the stunning South Island of New Zealand that has attracted hundreds of thousands of viewers from across the globe. The film charts a solo surf road trip of the South Island. 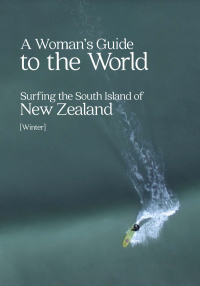 In the freezing New Zealand winter, Apolla is often the only surfer in the water - a fate that she says was both intimidating and exhilarating, At times I wondered why on earth I was doing this. Apolla only started surfing in her 30s. Despite donning a 5.5mm wetsuit, the cold was a constant on the trip, I was surfing every day and sleeping without electricity. Putting on the wet gear in the morning after a cold night was not pleasant.